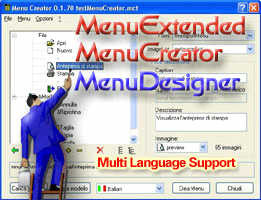 MenuBox - build powerful text-based menus, Catering Menu, CD or DVD Menu Design software. Menu Extended - a ActiveX DLL component for VB 6.0 that allow you to subclass VB menu on your programs. Power Autoplay Menu Creator - Menu creator tool to create powerful autoplay menus without any programming experience by Power Autoplay menu creator professional. you can create menus have buttons, photos, texts, html, flash files, RTF files, GIF files, Hyperlinks, Hot spots, Timers, and more..